This course covers some practical components of Ruby development including how to work with its file system. Ruby expert Jordan Hudgens will explore methods that enable Ruby programs to generate files and dynamically add data to preexisting files. 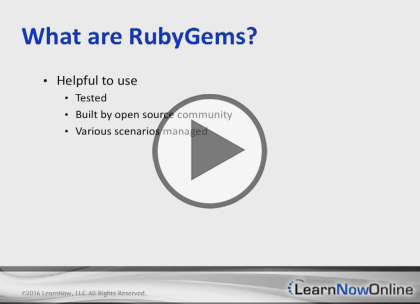 Later, to help you practically apply this knowledge, Hudgens will guide you through incorporating Ruby gems into an application and also building a Ruby program that connects to an outside API and works with the data which is sent back. You should be familiar with basic text editing in a Windows or Linux environment. No prior knowledge of programming is assumed.